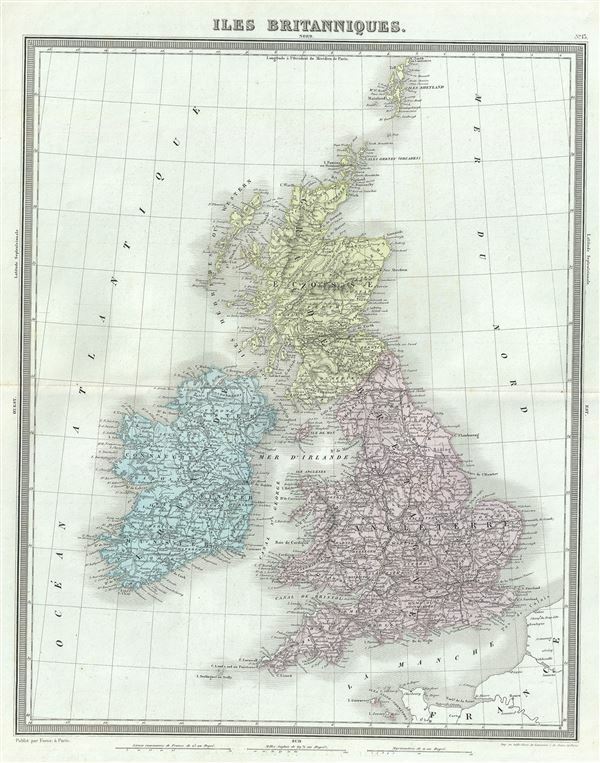 This is a beautiful 1874 map of the British Isles or Great Britain and Ireland by Ambroise Tardieu. It includes England, Wales, Scotland and Ireland and covers from the Shetland Islands to the English Channel. Throughout, the map identifies various cities, towns, rivers and an assortment of additional topographical details. During this time in history, Scotland was in the midst of the Industrial Revolution and emerging as the center of engineering and shipbuilding in the British Isles. Britain at the time was experiencing a rapid expansion of its empire to include India and parts of Africa. This map was prepared by Ambroise Tardieu and issued as plate 13 in his 1874 edition of Atlas Universel de Geographie Ancienne et Moderne. Ambroise Tardieu (March 2, 1788 - January 17, 1841) was a prominent French cartographer and engraver operating in the late 18th and early 19th centuries. Tardieu's work is known for its beauty and accuracy as well as for its depth of detail. Tardieu's most important work is his version of John Arrowsmith's large format map of the United States, published in 1806. Ambroise Tardieu is eclipsed in fame by his son, artist and medical scholar, August Ambroise Tardieu. Ambroise Tardieu is also frequently confused with Jean Baptiste Pierre Tardieu, another unrelated French map and print engraver active in the early 19th century. Furne, Jouvet et Cie Atlas Universel de Geographie Ancienne et Moderne (Paris), 1874. Very good. Minor wear along original centerfold. Original platemark visible. Minor spotting.